Leavening Walker, the route climbs quickly along high 89 and we're soon at the 8000 foot level at Monitor pass, then descending into one of the most crowded areas along the entire PCMCR, the Lake Tahoe basin. 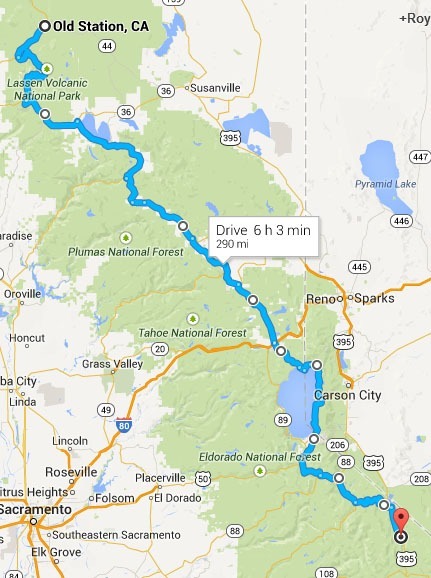 North of Tahoe the route follows the lovely high 89 as it meanders through forest and meadows till it reaches Lassen National park, a gem of a park that’s not to crowded and is worth some extra time. The section ends just north of the park at the small hamlet of Old Station. Camping and lodging are plentiful as is gas and food. This is once section of the trip where you don't need to think to much about services.